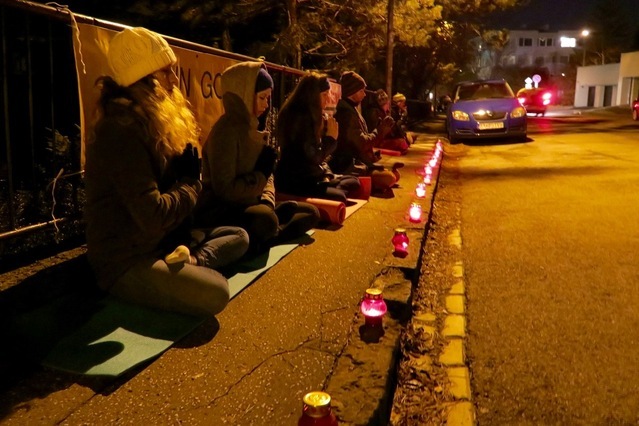 A candlelight vigil for the victims of the persecution of Falun Gong in China was held in the evening hours on Thursday, December 10, 2015, Human Rights Day, in front of the PRC Embassy in Bratislava. Participants commemorated the Chinese regime's suppression of Falun Gong that began in 1999. In the past 16 years, the campaign has claimed the lives of more than 3,906 documented victims (the actual death toll is much higher). Over the past decade, Falun Gong practitioners in Slovakia have collected 65,000 signatures condemning the persecution of Falun Gong in China. Slovakia has a population of about 5 million. Practitioners and their family members have so far filed more than 200,000 criminal complaints against former Chinese president Jiang Zemin, who ordered the brutal campaign to eradicate Falun Gong. Expressing solidarity with persecution victims, more then 400 Slovak citizens gave their signatures in support of bringing Jiang Zemin to justice.